Da Capo Lifelong Books, 9780738218694, 240pp. Dr. Jason Selk helps well-known professional and Olympic athletes as well as Fortune 500 executives and organizations develop the mental toughness necessary to thrive in the face of adversity and achieve elite-level results. Tom Bartow, following a career as a winning college basketball coach, became one of the country's top financial advisors and is now one of the premier business coaches nationwide. Together, Selk and Bartow reveal the secrets of how both elite athletes and business leaders climb to the top. 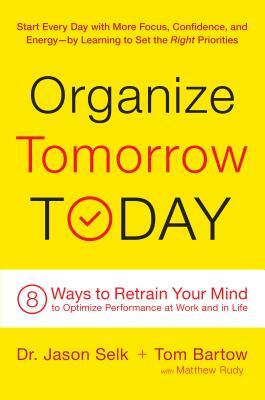 In Organize Tomorrow Today (OTT), two of the top minds in human performance come together to deliver the pathway to extreme success. Doing more is not the answer and Selk and Bartow walk you through how to achieve more by doing less. There is a huge difference between knowing something and understanding. There is an even wider gap between understanding and doing. Highly successful people never get it all finished in any given day; however, they always get the most important things completed. Selk and Bartow offer the 8 fundamentals of doing what is most important. OTT will show you the performance gains that athletes, executives, and salespeople spend tens of thousands of dollars to achieve. Dr. Jason Selk is one of the premier performance coaches in the United States, with dozens of professional athletes and Fortune 500 executives as his clients. As the Director of Mental Training for Major League Baseball's St. Louis Cardinals, Dr. Selk helped the team win two World Series championships, in 2006 and 2011. He is a regular contributor to Forbes, ABC, CBS, ESPN and NBC, and has been featured in USA Today, Men's Health, Muscle and Fitness, INC., and Self magazines. Matthew Rudy has ghostwritten 26 sports, business, and travel books since 1997, including titles by golf instructors Dave Stockton, Hank Haney, and Stan Utley; sports psychiatrist Dr. Michael Lardon, and personal development coach Bryan Dodge. His book with personal finance expert Anthony Davenport will be published by Houghton Mifflin Harcourt in 2017. He is a senior writer at Golf Digest, where he has ghostwritten 25 cover stories since 1999 and earned national awards for his investigative and feature work. Tom Bartow left a successful career as a college basketball coach to become one of the highest-producing financial advisors in Edward Jones's history. He went on to help American Funds's Capital Income Builder fund nearly triple in value. Since then, he has become one of the most creative and sought-after business coaches in the world, specializing in helping companies and individuals excel in times of adversity.